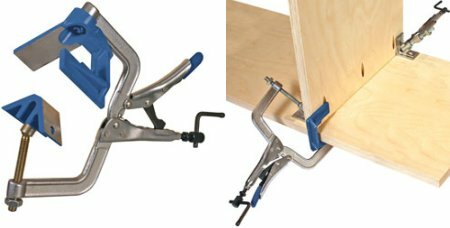 Kreg’s rolling out a new self-squaring corner clamp this month to complement their pocket hole tool lineup. They designed their new clamp to secure right-angle joints squarely before screwing them together. Kreg makes their corner clamp in China from heat-treated steel, nickel-plated to increase its corrosion resistance. Built like a set of locking pliers, the clamp employs a crank instead of a thumbscrew for rapidly adjusting the jaws. Able to handle material up to 1-1/4″ thick, the jaws’ large clamping surface won’t leave imprints on soft woods. To make positioning the clamp easier, the inside jaw swivels. After the joint is assembled, the jaws quickly release with a pull of a lever. When the 90° corner clamp ships September 15th, 2008 it’ll retail for $35. If you head over to McFeely’s or Amazon you can pre-order it now. I’ve just orderrd a set to try out. We do a lot of face frames and cabinet partition work. We use a lot of Kreg products – all work very well. Wish I would have had a set of these when building my bookcases. Used different corner clamps on the 4 corners at glue up. Would have loved to have a set of these for the interior fixed shelves.